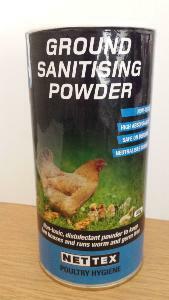 Ground Sanitising powder is used in coops and runs to significantly reduce worm egg numbers. It eliminates all stages of eggs and larvae at ground level. The opportunity for re-infection is greatly reduced as birds will ingest fewer eggs or larvae and this results in lower worm populations within the birds’ guts. • To cut off the warmth, moisture and oxygen in bird faeces that worm eggs need to develop and mature.